Chagas disease is a chronic infection caused by Trypanosoma cruzi, an intracellular protozoan parasite. Chronic chagasic patients (CCPs) have dysfunctional CD8+ T cells that are characterized by impaired cytokine production, high coexpression of inhibitory receptors, and advanced cellular differentiation. Most patients diagnosed in the chronic phase of Chagas disease already exhibit heart involvement, and there is no vaccination that protects against the disease. Antiparasitic treatment is controversial as to its indication for this stage of the disease. There is a lack of biological markers to evaluate the effectiveness of antiparasitic treatment, and little is known about the effect of the treatment on CD8+ T cells. Thus, the aim of the current study was to analyze the early effects of antiparasitic treatment on CD8+ T cells from CCPs with asymptomatic clinical forms of disease. To evaluate the CD8+ T cell subsets, expression of inhibitory receptors, and functionality of T cells in CCPs, PBMCs were isolated. The results showed that treatment of CCPs with the asymptomatic form of the disease induces an increase in the frequency of CD8+ central memory T cells and terminal effector T cells, a decrease in the coexpression of inhibitory receptors, an improved Ag-specific CD8+ T cell response exhibited by the individual production of IFN-γ or IL-2, and a multifunctional CD8+ T cell profile of up to four functions (IFN-γ+IL-2+Perforin+Granzyme B+). These findings suggest that, in CCPs, antiparasitic treatment improved the quality of Ag-specific CD8+ T cell responses associated with a decrease in inhibitory receptor coexpression, which could serve as biomarkers for monitoring the effectiveness of antiparasitic treatment. Trypanosoma cruzi, the etiological agent of Chagas disease, is an intracellular protozoan parasite that causes a complex disease that is endemic to Latin America and a serious public health problem (1). Approximately 6–7 million people are estimated to be infected worldwide (2). The disease has gained importance in nonendemic areas, such as the United States and European and Western Pacific countries, where there have been reported cases of infected people who migrated from endemic areas (3). The course of Chagas disease has two clinical phases: acute and chronic. During the acute phase, high levels of parasitemia induce a robust immune response, which can control but not completely eliminate the parasite. Then, most patients remain in the asymptomatic chronic phase and have undetectable parasitemia. Years or even decades after the acute infection, nearly 30–40% of these individuals can develop a symptomatic phase with cardiac or digestive alterations. There is no vaccine available to prevent Chagas disease, and the immune mechanisms that prevent the progression of the chronic phase are unknown (1, 2). Two nitroaromatic heterocyclic compounds, nifurtimox (NFX) and benznidazole (BZL), are available as treatment for T. cruzi infection; however, they present several limitations because of their toxicity and side effects related to gastrointestinal and neurologic involvement (1, 4). Antiparasitic treatment is recommended in patients with acute T. cruzi infection, infected children (includes congenital T. cruzi infection), chronic chagasic patients (CCPs) <18 y old (5–9), organ transplant patients, and immunosuppressed patients. During the acute phase, treatment can induce a parasitological cure in ∼60–85% of patients, but it is rare that patients are diagnosed at this stage (1). The efficacy for treatment of CCPs is controversial, but several studies in murine models and humans suggested that antiparasitic treatment during the early chronic phase of the disease prevents the development of a severe chronic cardiomyopathy (10–13). For instance, chronically infected mice treated with BZL had less parasitism and myocarditis than did untreated infected mice, as well as lower serum levels of Abs against T. cruzi Ags (11). In humans, the scenario is more complex; some studies suggested that treatment prevents disease progression in CCPs during the asymptomatic clinical form of the disease (10, 13) or even in the early symptomatic clinical phase of the disease (14, 15). Recently, a prospective, multicenter, randomized study involving 2854 CCPs with established severe cardiomyopathy who received BZL and were followed for 5.4 y showed that the treatment reduced parasite detection in peripheral blood, but it did not reduce cardiac clinical deterioration (16). Seroconversion is the method most used for assessing the efficacy of treatment, although, in many cases, it takes years or decades to detect a decrease in Ab titers (13, 17, 18). Thus, different biological markers (parasite biomarkers and host response/damage biomarkers) were proposed to evaluate short-term antiparasitic treatment efficacy in asymptomatic and symptomatic CCPs (19–21). For example, membrane receptors on T cells, the cell phenotype, and CD8+ T cell cytokine production were described as immunological host biomarkers after treatment (22–26). It was proposed that these biomarkers should be useful to predict the progression of Chagas disease in CCPs with the asymptomatic form of the disease, assess the efficacy of antiparasitic drugs, and identify early stage-specific characteristics for cardiac or gastrointestinal damage (20). CD8+ T cells play a crucial role in the course of T. cruzi infection, as in other infections caused by intracellular pathogens. This cell group is formed by a heterogeneous population and, according to surface markers, can be divided into T cell populations of stem cell memory (TSCM), central memory (TCM), transitional memory (TTM), effector memory (TEM), and terminal effector (TTE) cells (27, 28). CD8+ TSCM cells could be involved in repopulating the T cell pool that controls infection, but their levels are drastically reduced in CCPs with severe forms of the disease. Consequently, CD8+ TSCM cells can be associated with the deficient cellular immune response to T. cruzi infection and the outcome of Chagas disease (29). Considering the heterogeneity of T cells, there are no studies that compared the distribution of CD8+ T cell subsets between CCPs without or with antiparasitic treatment. However, in murine models, treatment was found to allow for the generation of TCM cells, which are involved in the generation of effector T cells and associated with a parasitological cure (23, 24). Therefore, it would be interesting to evaluate the distribution of these T cell subsets in humans to analyze the effect of antiparasitic treatment in the immune response. Previous studies by our group suggested that CCPs had an impaired CD8+ T cell response that is characterized by a reduced proliferative capacity and low CD28 expression in T cells (30). Additionally, CCPs had more terminally differentiated CD8+ T cells, a monofunctional CD8+ T cell response, and an increased coexpression of inhibitory receptors in comparison with patients with mild forms of cardiac disease (31). The effect of antiparasitic treatment on T cells is not fully understood; hence, it is important to find immunological biomarkers to evaluate the early efficacy of treatment in CCPs. Consequently, in this study, the short-term influences of antiparasitic treatment on the expression of CD8+ T cell subsets and the expression of the inhibitory receptors and functionality in CCPs were assessed. CCPs from endemic areas with the asymptomatic clinical form of the disease were recruited at the Instituto Nacional de Salud and at the Hospital Universitario San Ignacio in Bogota, Colombia. In addition, asymptomatic CCPs from Bolivia, not residing in endemic areas, were recruited and treated at the Hospital Virgen de la Arrixaca in Murcia, Spain. All subjects were tested for T. cruzi Abs using an indirect immunofluorescence assay and ELISA. The CCP group included individuals with a normal electrocardiogram, heart size, and left ventricular ejection fraction and a New York Heart Association class I designation (6). CCPs were further classified as nontreated patients (NTPs) or treated patients (TPs). 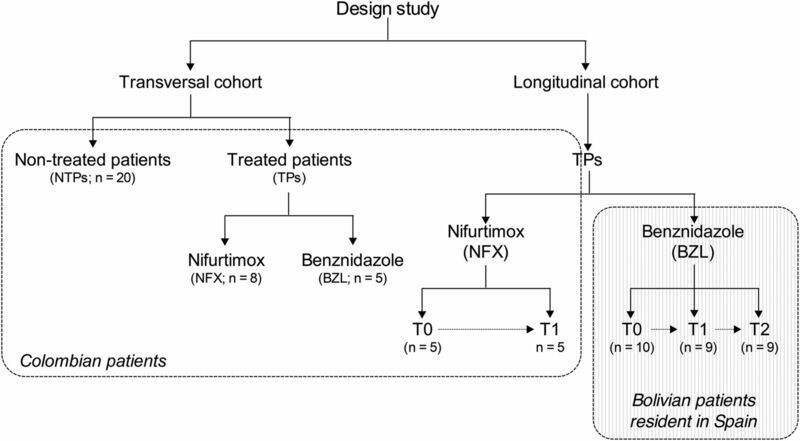 The TP group included individuals treated with NFX or BZL and was evaluated between 6 and 12 mo posttreatment. Additionally, two groups of CCPs treated with NFX or BZL were followed after the antiparasitic treatment was completed. Five Colombian patients were treated with NFX and were evaluated before treatment (T0) and at 6–12 mo posttreatment (T1), and 11 Bolivian patients residing in Spain were treated with BZL and evaluated at T0, T1, and at 24–30 mo posttreatment (T2) (Fig. 1). NFX or BZL was administered at 8 mg/kg/d for 90 d or 5 mg/kg/d for 60 d, respectively. A group of healthy donors (HDs) included nine seronegative individuals who resided in nonendemic areas and exhibited normal electrocardiogram results, heart size, left ventricular ejection fraction, and clinical presentation. The characteristics of the study population are summarized in Table I. This study was approved by the Research and Ethics Committees of the Facultad de Ciencias of Pontificia Universidad Javeriana, Instituto Nacional de Salud, Hospital Universitario San Ignacio (Colombia) and the Hospital Virgen de la Arrixaca and Consejo Superior de Investigaciones Científicas (Spain). All donors were volunteers and provided written informed consent before the study. Not all patients and controls were included in each study because of limitations imposed by blood volumes. The number of individuals for each experiment is given in the figure legend. Blood samples were obtained in heparinized tubes from all study participants. PBMCs were isolated with Ficoll-Paque PLUS (GE Healthcare, Uppsala, Sweden) from the heparinized blood. Nonfrozen cells and frozen cells stored in FBS with 10% DMSO were used in phenotypic and functional activity analyses for Colombian and Bolivian patients, respectively. T. cruzi soluble Ags (TcSA) were obtained as previously described (32, 33). Briefly, T. cruzi trypomastigotes (MHOM/CO/01/DA isolate, discrete typing unit I or MHOM/BR/00/Y isolate, discrete typing unit II) were obtained on a monolayer of renal fibroblast-like cells (VERO or LLC-MK2 cells) (ATCC CCL-81 or ATCC CCL-7) (34). The fibroblast-like cells were cultured in DMEM or RPMI 1640 (Eurobio, Les Ulis, France) supplemented with 10% FBS, 2 mM l-glutamine, 100 U/ml penicillin, 100 μg/ml streptomycin or 5% gentamicin, and 0.01 M HEPES (Eurobio). The cells were grown at 37°C in a humid atmosphere at 5% CO2. Amastigotes and trypomastigotes (ratio 1:1) were collected from the culture supernatant of fibroblast-like cells at 96 h postinfection (32). TcSA were obtained as previously described with some modifications (35). Then, parasites were washed twice with cold 1× PBS (Eurobio) and suspended at 1 × 106 parasites per microliter in lysis buffer that was prepared according to previously reported procedures (32, 33). The parasites were incubated on ice for 30 min, and the supernatant containing TcSA was collected by centrifugation at 12,000 × g for 15 min at 4°C and stored at −80°C until further use. The protein concentration was determined using a Bradford assay. The protein profile was analyzed by SDS-PAGE, followed by Coomassie blue staining (Life Technologies BRL, Grand Island, NY). The following conjugated Abs were used for cell surface staining: CD3–Pacific Blue (clone UCHT1), CD8–allophycocyanin–H7 (clone SK1), CD45RA-PE (clone HI100), CCR7–PE–Cy7 (clone 3D12), CD27–Alexa Fluor 700 (clone M-T271), CD95-allophycocyanin (clone DX2), CD127-FITC (clone HIL-7R-M21) (BD Pharmingen, San Diego, CA), CD28–PerCP–Cy5.5 (clone L293), 2B4-FITC (clone 2.69), PD-1–FITC (clone MIH4) (BD Biosciences, San Jose, CA), CD160–Alexa Fluor 647 (clone BY55; eBioscience, San Diego, CA), and TIM-3–PerCP (clone 344823; R&D Systems, Minneapolis, MN). Conjugated Abs for intracellular staining included the following: CTLA-4–allophycocyanin (clone BNI3), IFN-γ–FITC (clone 4S.B3), IL-2–PerCP–Cy5.5 (clone MQ1-17H12), TNF-α–Alexa Fluor 700 (clone MAb11), Granzyme B–PE–CF594 (clone GB11), IFN-γ–PE–Cy7 (clone B27), IL-2–allophycocyanin (clone MQ1-17H12), TNF-α–Alexa Fluor 488 (clone MAb11) (BD Biosciences), and Perforin-PE (clone B-D48; Abcam, Cambridge, U.K.). For exclusion of dead cells, the Fixable Aqua Dead Cell Stain viability marker (LIVE/DEAD) was used (Invitrogen, Eugene, OR). All conjugated Abs were titrated as previously described (33). To evaluate the CD8+ T cell subsets, 1 × 106 PBMCs were stained with the viability marker for 20 min in the dark at room temperature and washed with 1× PBS (Eurobio). Cells were stained with anti-CD3, anti-CD8, anti-CD45RA, anti-CCR7, anti-CD28, anti-CD27, anti-CD127, and anti-CD95 Abs for 30 min in the dark at 4°C and washed with staining buffer (1× PBS, 1% FBS). To identify the expression of inhibitory receptors, 1 × 106 PBMCs were stained with the viability marker and with anti-CD3, anti-CD8, anti-2B4, anti-CD160, anti–PD-1, and anti–TIM-3 Abs for 30 min in the dark at 4°C and washed with staining buffer. Then, cells were fixed and permeated with Cytofix/Cytoperm (BD Biosciences) for 20 min at 4°C for staining with anti–CTLA-4 Ab, followed by washing with 1× Perm/Wash (BD Biosciences). To determine the subsets and functional activity of CD8+ T cells, 1 × 106 PBMCs were cultured with medium as a negative control, staphylococcal enterotoxin B (SEB; Sigma-Aldrich, Saint Louis, MO) as a positive control, and TcSA (1 μg/ml) in the presence of anti-CD28 and anti-CD49d and incubated for 6 h in the presence of brefeldin A and monensin (BD Biosciences). After the culture, cells were stained with the viability marker and then with anti-CD3, anti-CD8, anti-CD45RA, anti-CCR7, and anti-CD95 Abs for 30 min in the dark at 4°C and washed with staining buffer. Cells were fixed and permeated for staining with anti–IFN-γ, anti–TNF-α, and anti–IL-2 Abs for 30 min in the dark at 4°C and washed with 1× Perm/Wash. To study the multifunctionality of CD8+ T cells in Bolivian patients, under the same conditions, PBMCs were cultured and stimulated with TcSA and stained with the viability marker. Then, cells were stained with anti-CD3, anti-CD4, and anti-CD8 Abs. Cells were fixed and permeated for staining with anti–granzyme B, anti-perforin, anti–IFN-γ, anti–IL-2, and anti–TNF-α Abs. At least 50,000 or 100,000 events, gated on live CD3+CD8+ cells, were acquired on a FACSAria II or FACSAria III flow cytometer (BD Immunocytometry Systems, San Jose, CA). Analysis was performed using FlowJo 9.3.2 (TreeStar, Ashland, OR), Pestle 1.7, and SPICE 5.3 (both from National Institutes of Health, Bethesda, MD) software. Dead and doublet cells were excluded from the analysis. In Colombian patients, a positive cytokine response was defined as a frequency >0.05%, determined as the average frequency of a CD8+ T cell response obtained from HD cells after stimulation with TcSA plus three SDs after background subtraction (cells from each of the CCPs cultured with medium). Data from Bolivian patients are expressed as the percentage of Ag-specific cellular responses minus the negative control. Statistical analyses were performed using the Mann–Whitney U test for two groups or the Wilcoxon signed-rank test. The tests were two tailed, and statistical significance was achieved at p < 0.05. GraphPad Prism 6.0b for Mac OS X software (GraphPad, San Diego, CA) was used for statistical analyses. The coexpression pie charts were compared using 10,000 permutations calculated with SPICE version 5.3 (36). To compare the total expression of CD8+ T cell subsets between HDs and CCPs with the asymptomatic clinical form of the disease without (NTPs) or with antiparasitic treatment (TPs) after 6–12 mo (Fig. 1, Table I), T cells were evaluated and divided into TSCM, TCM, TTM, TEM, and TTE cells. 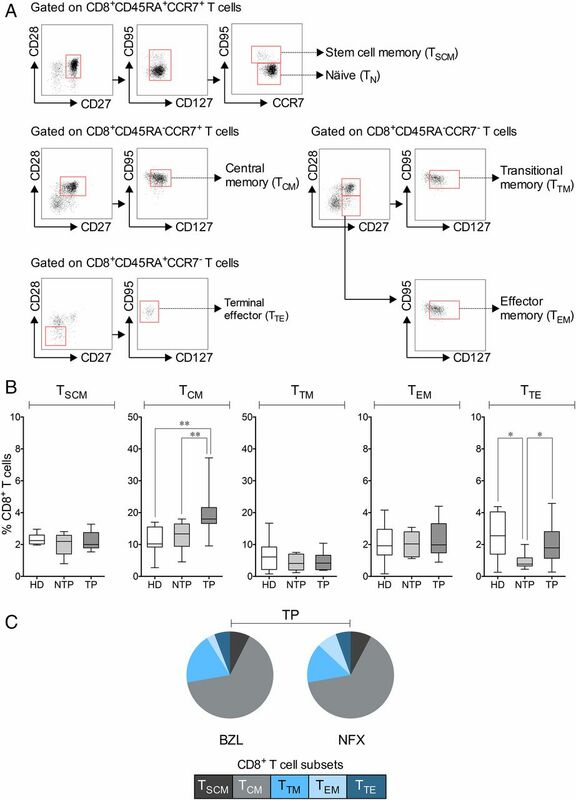 Naive cells were excluded to identify total memory CD8+ T cell subsets. PBMCs isolated from HDs, NTPs, and TPs were stained with conjugated Abs as described in Materials and Methods. The ex vivo selection of the CD8+ T cell subsets based on the differential expression of CD45RA, CCR7, CD28, CD27, CD95, and CD127 was performed as previously described (Fig. 2A, Supplemental Fig. 1) (29, 33). Initially, we assessed whether the type of antiparasitic treatment (NFX or BZL) had an effect on CD8+ T cell phenotypes, but no difference was found in the frequency of CD8+ T cell subsets between TPs treated with NFX or BZL (Supplemental Fig. 2). Based on these results, the following analyses were carried out with the TP group including the CCPs treated with NFX or BZL. Similar frequencies of CD8+ TSCM, TTM, and TEM cells were observed among HDs, NTPs, and TPs. However, a higher frequency of TCM cells was found in TPs compared with NTPs (p = 0.0058) and HDs (p = 0.0023), and a higher frequency of TTE cells was found in TPs (p = 0.0428) and HDs (p = 0.0220) compared with NTPs (Fig. 2B). Indeed, the proportion of CD8+ T cell subsets was uniform between TPs treated with BZL or NFX (Fig. 2C). Next, the frequency of CD8+ T cell subsets in three CCPs with the asymptomatic clinical form of the disease and treated with NFX was evaluated at T0 and T1. The frequency of CD8+ TCM cells had a tendency to increase within 1 y after treatment with NFX in all three patients followed (data not shown). Study design. A cohort of asymptomatic CCPs without antiparasitic treatment (NTPs) and a cohort of asymptomatic CCPs with antiparasitic treatment (TPs) (transversal cohort) were included in the study. In addition, a longitudinal cohort of asymptomatic CCPs treated with NFX or BZL were included and evaluated at T0, T1, and T2. The number of individuals for each group (n) is shown. Distribution of the total CD8+ T cell subsets from NTPs and TPs. (A) Representative dot plot of the gating strategy for CD8+ T cell subsets. CD8+ T cells were then separated by the expression of CCR7 and CD45RA. Subsequently, each subset was separated using the differential expression of CD28, CD27, CD127, and CD95 to discriminate between the six phenotypes of CD8+ T cells: naive (CD45RA+CCR7+CD28+CD27+CD127+CD95−), TSCM (CD45RA+CCR7+CD28+CD27+CD127+CD95+), TCM (CD45RA−CCR7+CD28+CD27+CD127+CD95+), TTM (CD45RA−CCR7−CD28+CD27+CD127+/−CD95+), TEM (CD45RA−CCR7−CD28−CD27+CD127−CD95+), and TTE (CD45RA+CCR7+CD28−CD27−CD127−CD95+). (B) Frequency of CD8+ TSCM, TCM, TTM, TEM, and TTE cells from HDs, NTPs, and TPs. (C) Proportion of CD8+ T cell subsets from TPs with BZL or NFX. Boxes (25th–75th percentiles) and whiskers (minimum to maximum) show the median frequency and range of the CD8+ T cell subsets. CCPs were divided into NTPs (n = 9) and TPs (n = 11). Additionally, nine HDs were included. *p < 0.05, **p < 0.01, Mann–Whitney U test. To assess whether antiparasitic treatment modifies inhibitory receptor expression or coexpression on CD8+ T cells from CCPs with the asymptomatic form of the disease, PBMCs from 14 NTPs and 9 TPs were stained with conjugated Abs, as described in Materials and Methods. A decrease in the frequency of CD8+ T cells expressing 2B4 (p = 0.0042), TIM-3 (p < 0.0001), CTLA-4 (p = 0.0183), and PD-1 (p = 0.0069) was observed in TPs compared with NTPs. Nonetheless, the frequency of CD8+ T cells that express CD160 (p = 0.2972) was similar between NTPs and TPs (Fig. 3A). When the coexpression of these inhibitory molecules was determined, a decreased proportion of CD8+ T cells coexpressing 2B4, CD160, and TIM-3 (Fig. 3B) or PD-1, CTLA-4, and TIM-3 was found in TPs compared with NTPs (Fig. 3C). Additionally, to determine the effect of antiparasitic treatment on the expression of inhibitory receptors in CD8+ T cells from the same patient, the expression and coexpression of these molecules in patients treated with NFX or BZL were evaluated at T0, T1, and T2. Interestingly, in four patients treated with NFX, a lower frequency of CD8+ T cells expressing and coexpressing 2B4, TIM-3, CTLA-4, and PD-1 was found at T1 compared with T0. In contrast, in nine patients treated with BZL who were followed for up to 30 mo posttreatment, a decrease in the frequency of 2B4 and PD-1 expression on CD8+ T cells was observed compared with that at T0 (data not shown). 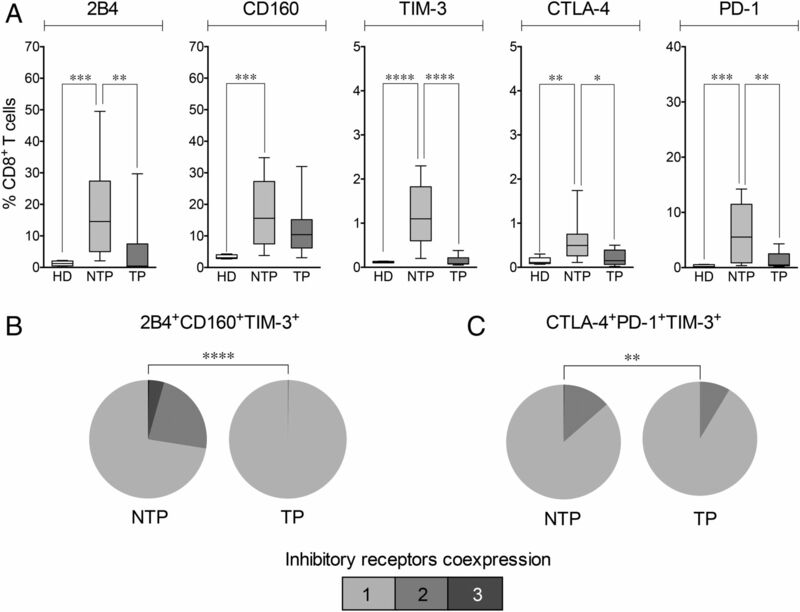 Inhibitory receptor expression and coexpression on CD8+ T cells from NTPs and TPs. (A) Frequency of CD8+ T cells expressing 2B4, CD160, TIM-3, CTLA-4, or PD-1 in HDs, NTPs, and TPs. Boxes (25th–75th percentiles) and whiskers (minimum to maximum) show the median frequency and range of the frequency of inhibitory receptors on CD8+ T cells. *p < 0.05, **p < 0.01, ***p < 0.001, ****p < 0.0001, Mann–Whitney U test. (B) Coexpression of 2B4, CD160, and TIM-3 on CD8+ T cells from NTPs and TPs. (C) Coexpression of CTLA-4, PD-1, and TIM-3 on CD8+ T cells from NTPs and TPs. The color in the pie charts depicts the coexpression of inhibitory receptors. CCPs were divided into NTPs (n = 14) and TPs (n = 9). Additionally, five HDs were included. The p values of the permutation test in the coexpression analysis (B and C) are shown in the pie charts (**p < 0.01, ****p < 0.0001). Because inhibitory receptor expression on CD8+ T cells in CCPs is linked to the functional response against T. cruzi Ags (31), we assessed the functional activity of CD8+ T cells from NTPs and TPs in response to SEB and TcSA, as described in Materials and Methods (Fig. 4A). Initially, the secretion of individual cytokines from CD8+ T cells was examined, and a higher frequency of CD8+ T cells producing IFN-γ (p = 0.0435) or IL-2 (p = 0.0381) was observed in TPs compared with NTPs (Fig. 4B). No differences were observed in the frequency of CD8+ T cells producing TNF-α (p = 0.0622), but it tended to be higher in TPs. Next, the frequency of CD8+ T cells with one, two, or three functions was compared between NTPs and TPs. In TPs, the prevalent functional profile of Ag-specific CD8+ T cells with one function was the production of TNF-α and with two functions was the production of IFN-γ and TNF-α (Fig. 4C). In contrast, when we analyzed the proportion of cells with one, two, and three functions after SEB stimulation, similar proportions of functional profiles of CD8+ T cells were found among HDs, NTPs, and TPs. In addition, a higher proportion of Ag-specific CD8+ T cells performing two functions was found in TPs compared with NTPs (Fig. 4D). Functional activity profile of T. cruzi–specific CD8+ T cells from NTPs and TPs. (A) Gating strategy for CD8+ T cells producing IFN-γ, TNF-α, and IL-2 after stimulation with medium alone, TcSA, or SEB. The gates applied for the identification of cytokine production on the total population of CD8+ T cells and the CD8+ T cell subsets were defined according to the cells cultured with medium alone for each individual. (B) Frequency of CD8+ T cells producing IFN-γ, TNF-α, or IL-2 in NTPs and TPs. (C) Frequency of CD8+ T cells with one, two, or three functions after stimulation with SEB (left panel) or TcSA (right panel). Boxes (25th–75th percentiles) and whiskers (minimum to maximum) show the median frequency of Ag-specific CD8+ T cells. (D) Proportions of functional activity profiles for T. cruzi–specific CD8+ T cells from HDs, NTPs, and TPs stimulated with SEB or TcSA. The color in the pie charts depicts the production of one, two, or three functions. CCPs were grouped according to NTPs (n = 8) and TPs (n = 5). *p < 0.05, Mann–Whitney U test. Given these results, the multifunctional profile of cells from CCPs who received BZL and were followed up to 30 mo posttreatment was analyzed. To analyze the Ag-specific CD8+ T cell response, IFN-γ, TNF-α, and IL-2 production, as well as the cytotoxic capacity for perforin and granzyme B after antigenic stimulation with TcSA, was assessed as described in Materials and Methods. First, the individual production of cytokines, as well as perforin and granzyme B, in CD8+ T cells was analyzed. A higher frequency of IFN-γ production was detected at T1 (p = 0.0313) and T2 (p = 0.0313) than at T0. In fact, a trend in IFN-γ and IL-2 production by CD8+ T cells was found according to the time after treatment (Fig. 5A), similar to the previous observation reported for the comparison of TPs and NTPs from Colombian patients (Fig. 4B). However, no difference in TNF-α, perforin, or granzyme B production was observed in CD8+ T cells among T0, T1, and T2 (data not shown). Next, we examined the multifunctional profile of the Ag-specific CD8+ T cell response at T0, T1, and T2 after TcSA stimulation (Fig. 5B). The profile of the responses was restricted and skewed toward a few of the possible combinations of functional profiles evaluated. At T0 and T1, the Ag-specific CD8+ T cell response was composed of two major populations: cells with one function (Granzyme B+ or Perforin+) and cells with two functions (Perforin+Granzyme B+). At T2, the responses were enhanced compared with those at T0 and T1 and were composed of three populations: cells with two functions (IL-2+Granzyme B+), three functions (IFN-γ+Perforin+Granzyme B+), and four functions (IFN-γ+IL-2+Perforin+Granzyme B+). Interestingly, in all patients treated with BZL, the proportion of multifunctional Ag-specific CD8+ T cells increased. The proportion of Ag-specific CD8+ T cells with three functions increased gradually after treatment, comparing T0 with T1 (p = 0.0742) and with T2 (p = 0.0195). The proportion of Ag-specific CD8+ T cells with four functions increased gradually when the patients were followed 30 mo posttreatment (Fig. 5C). These results suggest that antiparasitic treatment induced an improvement in the T. cruzi–specific CD8+ T cell response ≥2.5 y after ending the treatment. Multifunctional profile of CD8+ T cells in CCPs treated with BZL and followed for 30 mo posttreatment. (A) Frequency of CD8+ T cells producing IFN-γ or IL-2 in CCPs treated with BZL and assessed at T0, T1, and T2. (B) Frequency of CD8+ T cells with one, two, three, and four functions stimulated with TcSA from patients treated with BZL and assessed at T0, T1, and T2. Boxes (25th–75th percentiles) and whiskers (minimum to maximum) show the median of the frequency of Ag-specific CD8+ T cells. (C) Proportions of multifunctional activity for T. cruzi–specific CD8+ T cells from CCPs treated with BZL and evaluated at T0, T1, and T2. The color in the pie charts depicts the production of one, two, three, four, and five functions. CCPs were grouped according to T0 (n = 10), T1 (n = 9), and T2 (n = 9). *p < 0.05, Wilcoxon signed-rank test. Subsequently, we investigated whether the degree of multifunctionality in CCPs was linked to the CD8+ T cell subsets after treatment. The proportions of TSCM, TCM, TEM, and TTE cells performing one, two, and three functions, as measured by cytokine production (IFN-γ, TNF-α and IL-2), were evaluated. No differences were found between the frequencies of Ag-specific CD8+ TSCM, TCM, TEM, and TTE cells in NTPs and TPs (Fig. 6A). As expected, the proportion of these cells was similar in all CD8+ T cell subsets among HDs, NTPs, and TPs when the cells were stimulated with SEB (Fig. 6B). However, in T. cruzi–specific cells, a higher proportion of cells with two functions were observed in all CD8+ T cell subsets from TPs compared with NTPs. Interestingly, Ag-specific TCM and TEM cells from TPs showed more cells performing three functions compared with those from NTPs (Fig. 6C), suggesting that there was an improvement in the quality of the response of T. cruzi–specific CD8+ T cell subsets in CCPs with antiparasitic treatment independent of the quantity of Ag-specific CD8+ T cells. Multifunctional activity of T. cruzi–specific CD8+ T cell subsets from NTPs and TPs. (A) Comparison of the frequency of Ag-specific CD8+ TSCM, TCM, TEM, and TTE cells from NTPs and TPs. Boxes (25th–75th percentiles) and whiskers (minimum to maximum) show the median of the frequency of Ag-specific CD8+ T cells. The Mann–Whitney U test was used to calculate statistical significance. (B) Proportion of CD8+ T cell subsets stimulated with SEB from HDs, NTPs, and TPs. (C) Proportion of CD8+ T cell subsets stimulated with TcSA from NTPs and TPs. The color in the pie charts depicts the production of one, two, and three functions. CCPs were divided into NTPs (n = 8) and TPs (n = 5). Antigenic persistence is one of the main factors that affects the immune adaptive response and can lead to T cell exhaustion (37). Protective immunity in chronic infections was associated with the maintenance of memory CD8+ T cells for long periods, the expression of high levels of antiapoptotic molecules, the ability to proliferate independently of antigenic stimulation as a result of the presence of homeostatic cytokines (e.g., IL-7 and IL-15), a rapid differentiation to effector cells, and the quality of the memory T cell response in terms of multifunctionality, as measured by the capacity of cells to perform several functions (e.g., cytokine secretion and production of cytotoxic molecules) (27, 38–40). Chronic T. cruzi infection leads to the development of Chagas disease, in which the immunological mechanisms involved in sickness control remain unknown. Most patients are diagnosed in the chronic phase of the disease and already exhibit clinical symptoms and heart involvement. The progressive deficiency in the functional T cell response during T. cruzi infection is known to not help control parasite replication and, consequently, allows disease progression. Recently, during the course of Chagas disease, CD8+ T cells were observed to undergo a gradual loss of function that is characterized by impaired cytokine production, as well as the presence of advanced differentiation and increased inhibitory receptor coexpression (29, 31). Available treatment (NFX and BZL) for this stage of the disease is controversial (1, 4, 16). Several studies showed that antiparasitic treatment reduces the parasite load in the bloodstream (16, 41, 42). Furthermore, two recent studies showed that the efficacy of treatment depends on the degree to which the patient is compromised. Thus, the large Benznidazole Evaluation for Interrupting Trypanosomiasis (BENEFIT) study done in patients with established myocardiopathy showed that, despite elimination of the parasite, there was no improvement in the cardiac condition (16). In contrast, BZL treatment also was described to prevent the occurrence of electrocardiographic alterations in individuals without mild cardiac compromise (asymptomatic) (41). Antiparasitic treatment was demonstrated to induce a substantial activation of T cells and change in the T cell response related to the loss of the capacity for cytokine production by T cells after treatment (25, 43). Recently, CD4+ T cells in CCPs with antiparasitic treatment were shown to rebound, inducing a recovery in the production of IFN-γ (44). A recent study showed that asymptomatic CCPs treated with BZL have a higher frequency of CD4+ T cells that produce IFN-γ and TNF-α and a higher frequency of CD4+ Th17 cells compared with NTPs (42). Thus, the quality of the Ag-specific T cell response seems crucial for determining disease outcome after infections. In this study, antiparasitic treatment induced an increase in the frequency of CD8+ TCM cells and TTE cells and a decrease in the expression and coexpression of inhibitory receptors. Likewise, an enhancement in the Ag-specific CD8+ T cell response exhibited by the individual production of cytokines, such as IFN-γ or IL-2, and an improvement in the multifunctionality of the Ag-specific CD8+ T cells were observed. Furthermore, treatment allowed for an improvement in the quality of the response of CD8+ T cell subsets. In this study, it was found that soluble Ags from amastigotes and trypomastigotes from the parasite induce a specific response that is characterized by the production of cytokines and molecules with cytotoxic potential. In murine models and human T. cruzi infection, it was found that the type 1 response or Th1 measured by the production of IFN-γ plays a protective role and that perforin-producing cells contribute to the tissue lesions during chronic T. cruzi infection (29, 31, 45–48). Interestingly, in treated CCPs, a multifunctional CD8+ T cell profile with up to four functions, including IFN-γ and perforin, was found. Although the dual effect of these two effector mediators in CD8+ T cells from treated CCPs is unknown, it is possible that the production of both molecules has a beneficial effect in the antigenic control. Further studies are needed to prove this interesting hypothesis. Supporting this idea is the fact that, in an experimental murine model of T. cruzi infection, CD4+ and CD8+ T cell–mediated immunity elicited by the DNA–prime recombinant adenovirus-boost vaccination requires perforin and IFN-γ production (49). TCM cells have a greater capacity to generate TEM and TTE cells, as well as a better quality of cellular response to produce several cytokines, such as IFN-γ, TNF-α, or IL-2, than cells with a higher degree of differentiation (27). The higher frequency of TTE cells observed in TPs has been suggested to be due to the differentiation of TCM cells, which promote the migration of effector T cells to the site where the parasite is hidden. In murine models of T. cruzi infection, mice in which the infection resolves (parasitological cure) had a higher frequency of TCM cells (23, 24). Indeed, early-differentiated cells were proposed to be highly competent CD8+ T cells (22, 50). In contrast, our data showed that asymptomatic CCPs who received BZL or NFX treatment exhibited a lower frequency of CD8+ T cells expressing or coexpressing inhibitory receptors, such as 2B4, TIM-3, PD-1, or CTLA-4. Previous laboratory studies showed that CCPs with severe forms of the disease had a higher frequency of CD8+ T cells that expressed or coexpressed these inhibitory receptors compared with patients with mild forms of disease (31), indicating that exhaustion of CD8+ T cells occurs during advanced stages of the disease. The expression of these receptors in several chronic infections was associated with the dysfunctionality of T cells that can lead to apoptosis of Ag-specific T cells (51–54). In murine infection models produced by viruses and protozoa, the expression of inhibitory receptors was associated with the outcome of infection. Thus, inhibition of these receptors is related to an improvement in the response of T cells, causing a decrease in the antigenic load and even the total elimination of the Ag (55, 56). Because treatment with BZL decreases T. cruzi burden in CCPs (16), we suggest that the treatment may disrupt the continuous parasitic antigenic stimulation of immune cells, leading to changes in the response of CD8+ T cells and a decrease in the frequency of CD8+ T cells that coexpress inhibitory receptors that can improve the survival capacity of Ag-specific T cells. In a murine model of T. cruzi infection, it was described that CD8+ T cells expressing Fas (CD95) have a suboptimal capability response with a proapoptotic phenotype (57). Indeed, it was shown that anti-FasL treatment improved CD8+ T cell responses; this was accompanied by a high proliferative capacity and an increase in IFN-γ production leading to antigenic clearance (58). In humans, it was shown that CCPs with heart involvement had PBMCs with a low proliferative response that was associated with Ag-induced apoptosis and correlated with Fas/FasL expression compared with asymptomatic CCPs (59). In this study, it was observed that CCPs with antiparasitic treatment exhibited improvement in the multifunctionality of Ag-specific CD8+ T cells compared with NTPs. Overall, these findings suggest that antiparasitic treatment could lead to a decrease in the continuous antigenic stimulus, as reported in other studies (16, 41), avoiding Ag-induced activation of T cells and improving their survival and response, probably as a result of mechanisms other than Fas–Fas ligand interaction, such as homeostatic cytokines (60). However, further studies are needed to prove whether antiparasitic treatment of CCPs improves the proliferative response and survival of T cells. Interestingly, TPs had a higher frequency of CD8+ T cells producing IFN-γ or IL-2 compared with that detected at T0 in the two groups from different geographical areas of Latin America (T. cruzi–infected patients living in a Colombian endemic area and CCPs infected in Bolivia and currently living in Spain, a nonendemic area). Thus, an improvement in the Ag-specific CD8+ T cell response was observed in all subsets in TPs compared with NTPs, even showing three functions in TCM and TEM cells. When the expression profile of cytokines and cytotoxic molecules by CD8+ T cells from TPs was compared with NTPs, it was observed that treated Colombian and Bolivian patients trended toward a recovery of CD8+ T cell multifunctionality, with a few qualitative differences. We believe that this different multifunctional profile could be affected by continuous antigenic exposure to the genetic diversity of the T. cruzi parasite. In fact, the persistence and distribution of parasite genotypes can induce a different clinical disease and immune response (26, 61–63). In summary, these findings suggest that treatment leads to an improvement in the quality of the Ag-specific response of CD8+ T cell subsets in asymptomatic CCPs that is associated with a decreased frequency of CD8+ T cells coexpressing inhibitory receptors, as well as an increase in the functional capability of CD8+ T cells (cytokines and cytotoxic molecule expression). Therefore, monitoring of CCPs is crucial to assess whether the response of CD8+ T cells is constant and stable after treatment and whether the improved quality of the cellular response prevents cardiac damage. Thus, changes in the CD8+ T cells of treated CCPs can serve as biological markers of treatment efficacy. We thank the patients and healthy volunteers who participated in this study. We also thank Zulma Cucunubá and Rafael Herazo for contributions to the recruitment and medical examinations of Colombian CCPs. This work was supported by the Vicerrectoría de Investigación from Pontificia Universidad Javeriana (Proposal 00006233 and Project 00006330) and by Grants SAF2013-48527-R and SAF2016-81003-R from the Programa Estatal Investigación, Desarrollo e Innovación of the Ministerio de Economía y Competitividad, the Red de Investigación Cooperativa en Enfermedades Tropicales (RD12/0018/0021 and RD12/0018/0018), and Fondo Europeo de Desarrollo Regional. J.M. was supported by Ph.D. studentships from the Departamento Administrativo de Ciencia, Tecnología e Inovación and Pontificia Universidad Javeriana. T cell populations of transitional memory. 2015. Chagas’ disease. N. Engl. J. Med. 373: 456–466. World Health Organization 2016. Chagas disease (American trypanosomiasis) - Fact Sheet No. 340 (updated March 2016). Available at: http://www.who.int/mediacentre/factsheets/fs340/en/.
. 2010. Chagas disease: a Latin American health problem becoming a world health problem. Acta Trop. 115: 14–21. 2011. Antitrypanosomal therapy for chronic Chagas’ disease. N. Engl. J. Med. 364: 2527–2534.
. 1998. Efficacy of chemotherapy with benznidazole in children in the indeterminate phase of Chagas’ disease. Am. J. Trop. Med. Hyg. 59: 526–529.
. 2007. Evaluation and treatment of Chagas disease in the United States: a systematic review. JAMA 298: 2171–2181.
. 2009. Use of benznidazole to treat chronic Chagas’ disease: a systematic review with a meta-analysis. J. Antimicrob. Chemother. 64: 1139–1147.
. 2011. Congenital Chagas disease: recommendations for diagnosis, treatment and control of newborns, siblings and pregnant women. PLoS Negl. Trop. Dis. 5: e1250.
. 2013. Immunosuppression and Chagas disease: a management challenge. PLoS Negl. Trop. Dis. 7: e1965.
. 2000. Evolutive behavior towards cardiomyopathy of treated (nifurtimox or benznidazole) and untreated chronic chagasic patients. Rev. Inst. Med. Trop. Sao Paulo 42: 99–109.
. 2005. Treatment with benznidazole during the chronic phase of experimental Chagas’ disease decreases cardiac alterations. Antimicrob. Agents Chemother. 49: 1521–1528.
. 2012. Posttherapeutic cure criteria in Chagas’ disease: conventional serology followed by supplementary serological, parasitological, and molecular tests. Clin. Vaccine Immunol. 19: 1283–1291.
. 2006. Long-term cardiac outcomes of treating chronic Chagas disease with benznidazole versus no treatment: a nonrandomized trial. Ann. Intern. Med. 144: 724–734.
. 2001. Parasite persistence in treated chagasic patients revealed by xenodiagnosis and polymerase chain reaction. Mem. Inst. Oswaldo Cruz 96: 823–826.
. 2000. Progressive chronic Chagas heart disease ten years after treatment with anti-Trypanosoma cruzi nitroderivatives. Am. J. Trop. Med. Hyg. 63: 111–118.
. 2015. Randomized trial of benznidazole for chronic Chagas’ cardiomyopathy. N. Engl. J. Med. 373: 1295–1306.
. 2007. Trypanocide treatment among adults with chronic Chagas disease living in Santa Fe city (Argentina), over a mean follow-up of 21 years: parasitological, serological and clinical evolution. Rev. Soc. Bras. Med. Trop. 40: 1–10.
. 2002. A critical review on Chagas disease chemotherapy. Mem. Inst. Oswaldo Cruz 97: 3–24.
. 2014. Biological markers for evaluating therapeutic efficacy in Chagas disease, a systematic review. Expert Rev. Anti Infect. Ther. 12: 479–496.
. 2015. Biomarkers of therapeutic responses in chronic Chagas disease: state of the art and future perspectives. Mem. Inst. Oswaldo Cruz 110: 422–432.
. 2013. Evaluating Chagas disease progression and cure through blood-derived biomarkers: a systematic review. Expert Rev. Anti Infect. Ther. 11: 957–976.
. 2006. Trypanosoma cruzi modulates the profile of memory CD8+ T cells in chronic Chagas’ disease patients. Int. Immunol. 18: 465–471.
. 2008. Drug-induced cure drives conversion to a stable and protective CD8+ T central memory response in chronic Chagas disease. Nat. Med. 14: 542–550.
. 2014. New, combined, and reduced dosing treatment protocols cure Trypanosoma cruzi infection in mice. J. Infect. Dis. 209: 150–162.
. 2009. Changes in Trypanosoma cruzi–specific immune responses after treatment: surrogate markers of treatment efficacy. Clin. Infect. Dis. 49: 1675–1684.
. 2014. Cytokine profiling in Chagas disease: towards understanding the association with infecting Trypanosoma cruzi discrete typing units (a BENEFIT TRIAL sub-study). PLoS One 9: e91154.
. 2008. T-cell quality in memory and protection: implications for vaccine design. Nat. Rev. Immunol. 8: 247–258.
. 2013. The who’s who of T-cell differentiation: human memory T-cell subsets. Eur. J. Immunol. 43: 2797–2809.
. 2015. Low frequency of circulating CD8+ T stem cell memory cells in chronic chagasic patients with severe forms of the disease. PLoS Negl. Trop. Dis. 9: e3432.
. 2013. T lymphocytes from chagasic patients are activated but lack proliferative capacity and down-regulate CD28 and CD3ζ. PLoS Negl. Trop. Dis. 7: e2038.
. 2015. Inhibitory receptor expression on CD8+ T cells is linked to functional responses against Trypanosoma cruzi antigens in chronic chagasic patients. J. Immunol. 195: 3748–3758.
. 2011. Short-term follow-up of chagasic patients after benzonidazole treatment using multiple serological markers. BMC Infect. Dis. 11: 206.
. 2013. Design of a multicolor panel to assess intracellular and surface molecules by flow cytometry. Biomedica 33: 660–672.
. 2008. Evaluation of TcH2AF-R and S35-S36 primers in PCR tests for the detection of Trypanosoma cruzi in mouse cardiac tissue. Biomedica 28: 616–626.
. 2007. Characterization of the RNA polymerase II and III complexes in Leishmania major. Int. J. Parasitol. 37: 491–502.
. 2011. SPICE: exploration and analysis of post-cytometric complex multivariate datasets. Cytometry A 79: 167–174. 2011. T cell exhaustion. Nat. Immunol. 12: 492–499.
. 2011. A human memory T cell subset with stem cell-like properties. Nat. Med. 17: 1290–1297.
. 2000. Cutting edge: increased expression of Bcl-2 in antigen-specific memory CD8+ T cells. J. Immunol. 164: 3950–3954.
. 2008. Homeostasis of naive and memory T cells. Immunity 29: 848–862.
. 2016. Evaluation of parasiticide treatment with benznidazol in the electrocardiographic, clinical, and serological evolution of Chagas disease. PLoS Negl. Trop. Dis. 10: e0004508.
. 2016. Changes in the immune response after treatment with benznidazole versus no treatment in patients with chronic indeterminate Chagas disease. Acta Trop. 164: 117–124.
. 2008. Etiological treatment during early chronic indeterminate Chagas disease incites an activated status on innate and adaptive immunity associated with a type 1-modulated cytokine pattern. Microbes Infect. 10: 103–113.
. 2016. Treatment success in Trypanosoma cruzi infection is predicted by early changes in serially monitored parasite-specific T and B cell responses. PLoS Negl. Trop. Dis. 10: e0004657.
. 2002. Type 1 immunity provides optimal protection against both mucosal and systemic Trypanosoma cruzi challenges. Infect. Immun. 70: 6715–6725.
. 2004. Frequency of interferon- gamma -producing T cells specific for Trypanosoma cruzi inversely correlates with disease severity in chronic human Chagas disease. J. Infect. Dis. 189: 909–918.
. 2012. CD8+ T-cells expressing interferon gamma or perforin play antagonistic roles in heart injury in experimental Trypanosoma cruzi–elicited cardiomyopathy. PLoS Pathog. 8: e1002645.
. 2006. Distinct kinetics of effector CD8+ cytotoxic T cells after infection with Trypanosoma cruzi in naive or vaccinated mice. Infect. Immun. 74: 2477–2481.
. 2009. 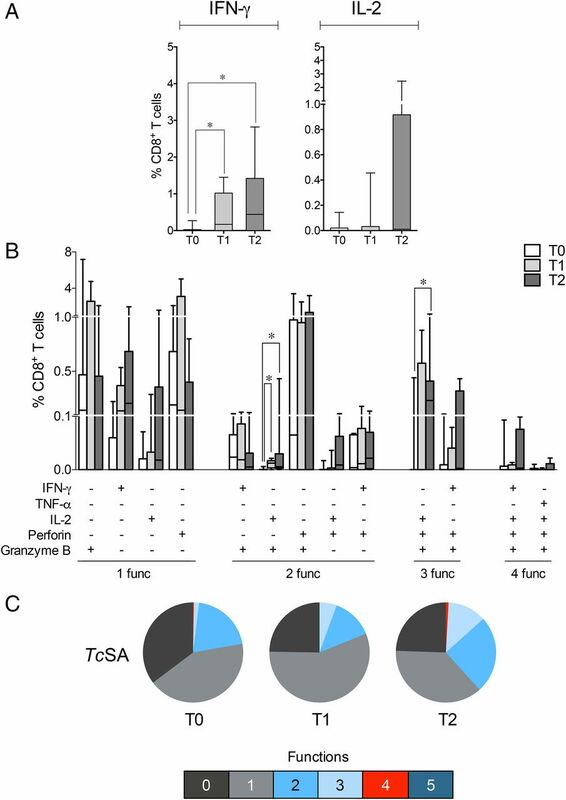 Perforin and gamma interferon expression are required for CD4+ and CD8+ T-cell-dependent protective immunity against a human parasite, Trypanosoma cruzi, elicited by heterologous plasmid DNA prime-recombinant adenovirus 5 boost vaccination. Infect. Immun. 77: 4383–4395.
. 2008. Phenotype and function of human T lymphocyte subsets: consensus and issues. Cytometry A 73: 975–983.
. 2010. Coexpression of PD-1, 2B4, CD160 and KLRG1 on exhausted HCV-specific CD8+ T cells is linked to antigen recognition and T cell differentiation. PLoS Pathog. 6: e1000947.
. 2012. T cell exhaustion in protozoan disease. Trends Parasitol. 28: 377–384.
. 2001. Sustained dysfunction of antiviral CD8+ T lymphocytes after infection with hepatitis C virus. J. Virol. 75: 5550–5558.
. 2014. Impairment of T cell function in parasitic infections. PLoS Negl. Trop. Dis. 8: e2567.
. 2011. Therapeutic blockade of PD-L1 and LAG-3 rapidly clears established blood-stage Plasmodium infection. Nat. Immunol. 13: 188–195.
. 2012. Pathogen-induced proapoptotic phenotype and high CD95 (Fas) expression accompany a suboptimal CD8+ T-cell response: reversal by adenoviral vaccine. PLoS Pathog. 8: e1002699.
. 2007. The Fas death pathway controls coordinated expansions of type 1 CD8 and type 2 CD4 T cells in Trypanosoma cruzi infection. J. Leukoc. Biol. 81: 942–951.
. 2008. Fas/Fas-L expression, apoptosis and low proliferative response are associated with heart failure in patients with chronic Chagas’ disease. Microbes Infect. 10: 29–37.
. 2009. Cellular and molecular mechanisms of memory T-cell survival. Expert Rev. Vaccines 8: 299–312.
. 2010. Trypanosoma cruzi–specific immune responses in subjects from endemic areas of Chagas disease of Argentina. Microbes Infect. 12: 359–363.
. 2012. The revised Trypanosoma cruzi subspecific nomenclature: rationale, epidemiological relevance and research applications. Infect. Genet. Evol. 12: 240–253.
. 2013. Polyfunctional T cell responses in children in early stages of chronic Trypanosoma cruzi infection contrast with monofunctional responses of long-term infected adults. PLoS Negl. Trop. Dis. 7: e2575.